This post about gold and the US dollar index is essentially a continuation of my last post. I am briefly going to go over the current situation. I have not made any trades this last week. First, let us observe a daily chart for December gold futures. 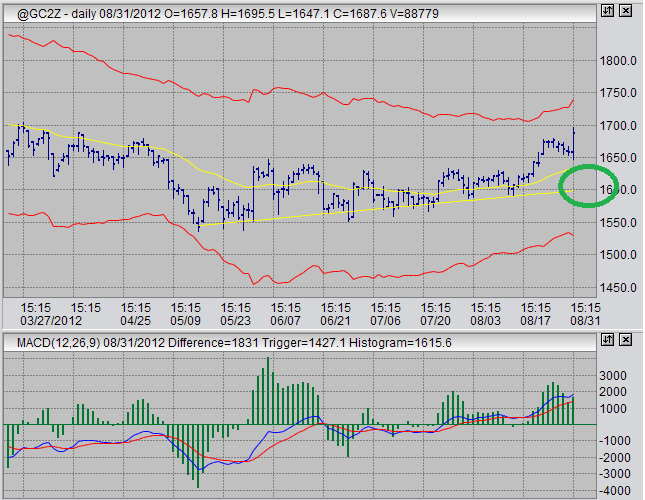 We saw a strong rally on Friday, August 31, 2012 in futures trading for this precious metal. Prices almost reached 1700, which is what I was hoping for. I am not hoping that they will fall back down near the weekly moving average that I have set. Coincidentally, my daily and weekly moving averages for this metal are at very similar prices. My entry target for a long position is going to be in the 1600-1620 range, if at some point this month they fall into that range, I will be aggressively looking for entry signals in the 60 minute time frame using MACD divergences in that time frame. Next, let us observe a weekly chart for the US dollar index. As we can see on this weekly chart for September dollar index futures, prices made a new low this week as compared to last. I am looking for one thing here, strong MACD divergences on the 60 minute chart. Prices are where I want them now, and a signal in that time frame is a signal that I will most likely trade. I am anticipating that either prices will bounce off of this moving average quickly and robustly, or that they will have a bunch of blips dodging above and below the average for a while. This is what occurred several months ago and is highlighted by and orange rectangle in the chart. That three month time frame still afforded several good trading opportunities using the 60 minute charts, even though the major move did take three months to develop. I'm not going to post a chart for sugar, because its pretty much the same as it was in my last futures blog post. I'm still waiting for an MACD divergence to show itself on the daily time frame before looking for an entry.